The new Terminator movie flopped. There’s no polite way to say it. I suppose this makes sense. Interest in the series has waned since Terminator 2: Judgment Day, and Schwarzenegger’s value in Hollywood has been dwindling for a decade or so — Terminator Genisys is the seventh time in a row that a movie he’s been in has opened under $30 million. Worse, thanks to the franchise’s worn-thin time-travel plot device, the Terminator stories have gotten fuzzier and fuzzier, and the movies more and more convoluted. Not great. Number 2: They’re fun. They’re fun to watch and to think about and argue about and (occasionally) imagine yourself inside of. Terminator Genisys, a time-travel movie that flopped, wasn’t terrible. It wasn’t as bad as Terminator Salvation, and it SURE AS HELL WASN’T AS BAD AS TERMINATOR 3. No, Genisys can’t keep pace with the first or the second one, but that’s because the first and the second ones are truly iconic and important. And so Genisys lands somewhere in between the bad Terminator movies and the great Terminator movies — it’s not a good movie, but it’s a stupid (enough) and fun (enough) movie. But let’s say it didn’t flop. Let’s say we jumped timelines like they do in these movies, and in this one Genisys is a mega-success. What ends up happening? A bunch of stuff ends up happening. The camera cuts to black. A chryon reads: “Junior 2.” Then there’s gunfire and the bullets carve out the rest of the title: “: The Reckoning.” OHHH FUUUUUU IT’S A MASTERPIECE with an ending that “rewrites surprise endings for the better,” Grantland’s Wesley Morris writes in his review. The movie is such a blockbuster hit that the pendulum finally swings back and we get a rush of action movies like in the late ’80s and early ’90s, where the stars were untouchably cool and not gloomy, despondent sad boys. All our heroes are back. We get Demolition Man 2. We get Cobra 2. We get Tango & Cash 2. We get Hard to Kill 2. We get a Bloodsport reboot WITH JEAN-CLAUDE VAN DAMME THIS TIME, OK.
More than that, we get new action movie stars poured in the classic mold. There’s Rodney Hammer, who stars in the new franchise Death Master, which is about a mortician who’s a former Black Ops commander who accidentally finds himself in the middle of a war between a criminal syndicate and an overmatched police force in a small town. There’s Brock Thompson, star of the controversial Adopted Warrior, which is about a white kid who gets adopted by an Asian family and learns “all of the secrets of the Orient,” as the movie poster suggests. It absorbs (not unfair) claims of racism, but it scores a $420 million opening weekend, so they just keep cranking them out. And there’s Guillermo Muerte, the first-ever Latino to star in a major American action-movie franchise. His is called The Landscaper, and no Latinos even complain about it because we’re all just so happy we finally got one. In the movie, Muerte is a third-generation Mexican American who, against his family’s wishes, turns down scholarships from literally every university in the country and joins the Marines instead. He thrives there and is eventually selected to oversee Bravo Infinity, the most elite killing squad in U.S. history. He returns home following four tours of duty overseas to find that the real terrorist is a man in his hometown known only as El Cucuy (pronounced kuh-coo-ee, Spanish for “the Bogeyman”). Nobody knows El Cucuy’s real name or what he looks like — they only know that anyone who has ever bucked back against him and his oppression has been found dead shortly thereafter, often dismembered and always displayed publicly. The movie ends in a confrontation between Muerte and El Cucuy, and the fight is big and bloody and ultraviolent. Nobody can remember ever seeing anything as overwhelming, moving, or transcendent as that fight. It’s perfectly shot and brilliantly lit. For all of the movement, for all of the fire and explosions and devastation, El Cucuy manages to keep his face in the shadows. It’s like a magic trick. It’s like he has no face at all. Muerte sits up slowly, gingerly. “How do you plan to shave without these?” and Muerte extends two closed fists toward El Cucuy to imply that he’s holding something. The camera zooms in tighter on the two of them, but not close enough that you can see what he’s hiding. El Cucuy takes a step closer to see what Muerte’s got. And before El Cucuy can finish, Muerte reaches up, grabs him by the wrists, puts his feet in his chest, and mega-kicks him several feet backward, tearing El Cucuy’s arms from his torso. “AHHHHHHHHHHHHHHHHHHHHHH!” El Cucuy’s scream is monumental. And then it’s a whimper. He bleeds out while Muerte watches. Muerte gets up, walks over to El Cucuy. “Without these,” he says, and drops them onto the floor next to him. He walks off into the darkness. The camera stays on him until he’s gone. Once he’s all the way out of the frame, the camera slowly pans back around toward El Cucuy. It starts at his feet. It glides up to his knees, then past his thighs, then up to his waist. Belly, chest, neck, and then finally, FINALLY, the face. He lost his arms in this timeline, too. And that’s what would have happened if Terminator Genisys hadn’t bombed this weekend. 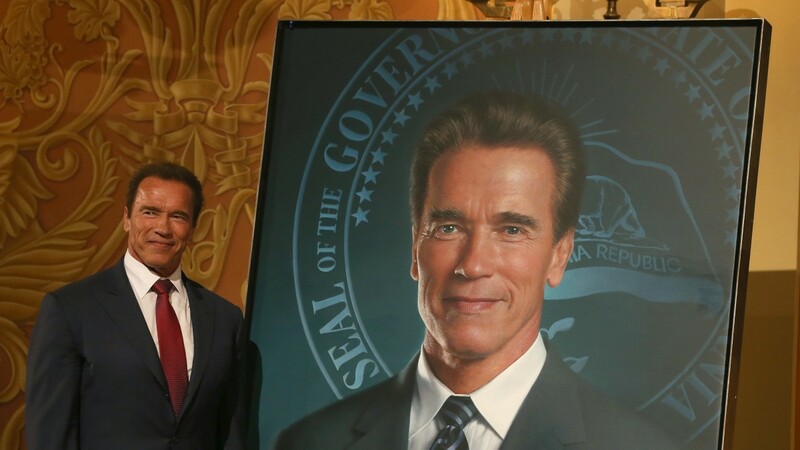 Thanks for nothing, Arnold. Not Danny DeVito twins, though we can see why you’d think that.